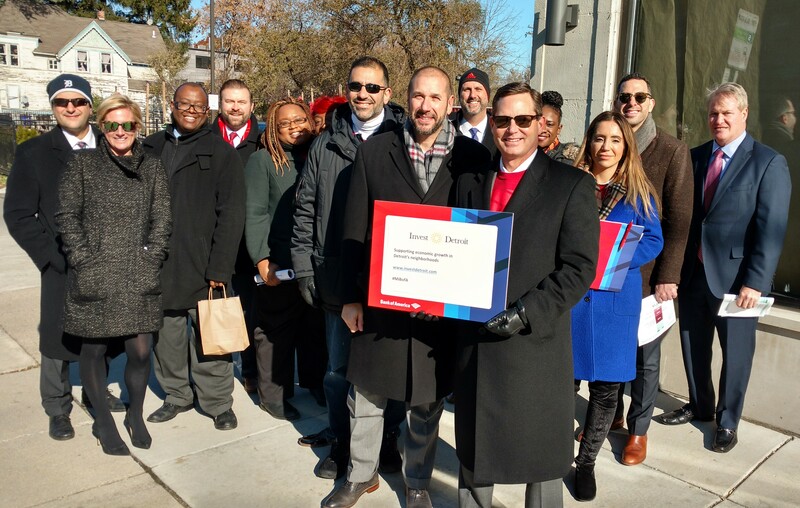 The Bank of America Charitable Foundation celebrated its annual “Detroit Day of Giving” on November 14, which focuses on ensuring individuals and families in metropolitan Detroit have access to the tools and resources that support economic mobility including basic needs and services. The Foundation distributed $1.1 million in community giving to 39 local Detroit nonprofits in 2018. Additionally, the bank contributed nearly $3 million in Michigan through grants, sponsorships, contributions by bank employees and matching gifts. Twelve employee teams and more than 100 Bank of America teammates volunteered and visited the organizations in metro Detroit, learning firsthand the impact the grants will have on the nonprofits’ goals. The grants are a part of the bank’s philanthropic investments that are aimed at improving the lives of individuals and families and the communities in which they live. Metro Detroit families and individuals face difficult financial decisions every day and our nonprofit community plays a crucial role in providing some of these essential services that help people find their way to economic stability. This includes emergency shelter, access to food, financial education and benefits, and reaching individuals at their immediate point of need to connect them to programs and resources. Organizations that received grants include: Accounting Aid Society; Big Brothers Big Sisters of Metro Detroit; Black United Fund of Michigan; Build Institute; Catholic Charities of Southeast Michigan; Chaldean American Ladies of Charity; Civilla Grant; Community Development Advocates of Detroit; Crime Stoppers of Michigan; Detroit Riverfront Conservancy; DESC; Design Core Detroit; Detroit Police Athletic League (PAL); Fair Food Network; Focus: HOPE; Global Detroit; GLWBC; Racquet Up; Greening of Detroit; Habitat for Humanity Oakland County Team; Invest Detroit; Junior Achievement of Southeast Michigan; JVS; Lighthouse of Oakland County; Macomb County Warming Center Team; Midnight Golf; S.A.Y. Detroit; Salvation Army; Southwest Detroit Business Association (SDBA); SER Metro; Tech Town; Urban Neighborhood Initiatives and YMCA of Metropolitan Detroit. A very special component of Bank of America’s Day of Giving is the Neighborhood Builders Awardees. The Neighborhood Builders program deploys capital in communities and builds cross-sector partnerships, advancing economic and social progress as part of our approach to responsible growth. The bank announced the Community Development Advocates of Detroit (CDAD) and Jefferson East, Inc. (JEI) as its 2018 awardees. The bank presented these two nonprofits with $400,000 in grants — $200,000 each — to increase their impact in the community through program expansion or operations and advanced leadership training. According to research from the University of Michigan, as well as research from Local Initiatives Support Corporation, CDAD members have provided somewhere in excess of $250 million in economic development, including 3,500 new or rehabilitated units of affordable housing and over 600,000 square feet of new or renovated commercial retail space. The mission of Jefferson East, Inc.(JEI) is to grow Detroit’s east Jefferson corridor and its neighborhoods through facilitative leadership, collaborative partnership, innovative and impactful programming. JEI represents five distinct neighborhoods along the east Jefferson corridor and provides programming within a boundary area of 18.4 square miles and represents approximately 42,120 residents. From historic homes and modern apartment buildings, living and working along the corridor provides access to Detroit’s city parks, nationally renowned Belle Isle, the active RiverWalk and connections to the Dequindre Cut. Bank of America created Neighborhood Builders in 2004 to strengthen the network of nonprofit leadership that is critical to helping our local communities thrive. Since then, Bank of America has invested more than $220 million in grants to build more sustainable communities – one of the nation’s largest philanthropic investments in nonprofit leadership development.